We know that Edmund Cullimore sold Walter William Pitcher a plot of land containing one rood and 25 perches on 5th July 1888. It had previously been part of the orchard land which Edmund had purchased in 1886 from John Wetmore Grove. Edmund was using the rest of the land to build his own house which became ‘Shen‘ and the Sawmill. We have heard an account that it was Edmund Cullimore who built number 24 Gloucester Road for the Pitchers, but we have seen no documentary proof of this. Indeed it would be surprising as Edmund was a timber merchant, not a builder. On the other hand, Walter was a builder, capable of undertaking major building projects in the area, such as the building of St Pauls Church, The Hackett. It is highly likely therefore that he built his own house, possibly after building Shen for Edmund. 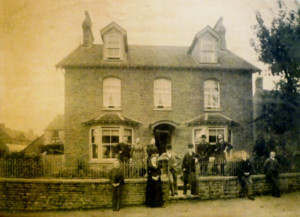 The thumbnail on the right shows the Pitcher family standing outside the house about 1900. Click on the thumbnail to see a larger image. The naming of the House – it is somewhat surprising that such a distinctive house was not given a name, as it was fashionable at the time for such houses to have names. We have not found a record of any name for the house, except during the period following the Second World War, when Elwyn called the house ‘Sycamore House‘ when registering to vote. No-one else in the house gave that name when they registered, and Elwyn himself did not use the name after 1954. We have some distant memory of Elwyn talking about why he called it Sycamore House. His argument was along the lines of his house was as good as ‘The Elms’ and if the owners of that house had taken it upon themselves to give their house a fancy name, then so could he. From the electoral registers it does not appear that Eva and Helen agreed with this attitude. Peculiarities of the house – during the 1990s Elwyn invited us to look around the house. He was very proud of the house’s water system. Water for the bath was still being pumped up from the cistern under the house which collected rain water. Helen and Eva both felt that the rainwater was responsible for their soft skin and shiny hair. The Pitchers claimed that the house was the first in Thornbury to have a bath. We were impressed by the size of the house (one small room was laid out with shelves solely for the storage of apples) and the fact that so little had changed since the house had been built. 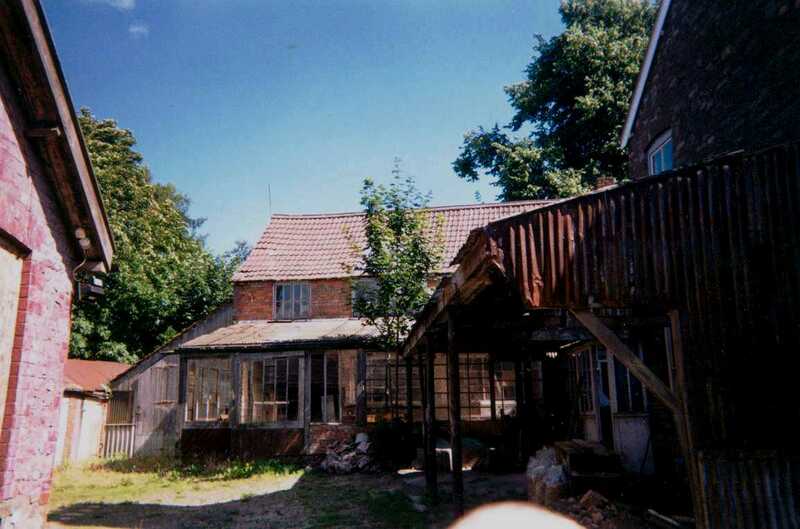 In the 1990s the yard adjoining the house was left very much as it had been during the time of Leonard Pitcher and tools were laid out on the bench apparently as they had always been. The yard has since been renovated and still has practical uses. We were surprised to discover that whilst other houses in Thornbury lost the iron railings during the Second World War, number 24 still has their original railings. Leonard must have had some influence with the authorities! 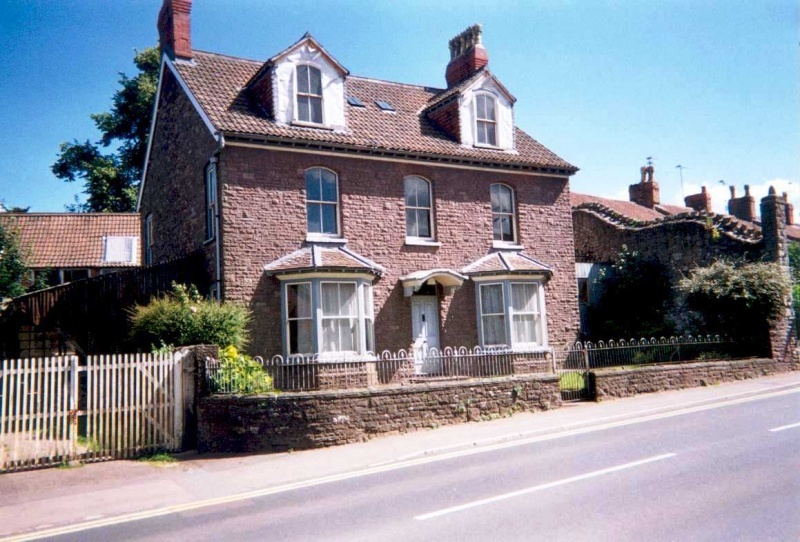 The house was finally sold following the deaths of Elwyn in 1998 and his wife, Eva in 2000. It was pleasing to see that during the building work done on the house by the new owners the name of ‘W Pitcher and Sons Coachbuilders’ has been uncovered at the back of the yard and a metal advertising sign for the firm has been loaned by Thornbury Museum sign and has been erected on the workshops alongside the gateway. The owners also deserve credit for the efforts that they have made to preserve the original appearance of the house . We’re sure Walter William would ave been proud!